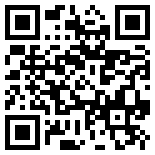 Random Access Memories » Blog Archive » LEGO Pathfinder Campaign – Behind the screen. 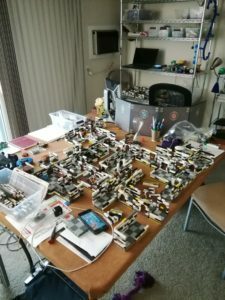 LEGO Pathfinder Campaign – Behind the screen. 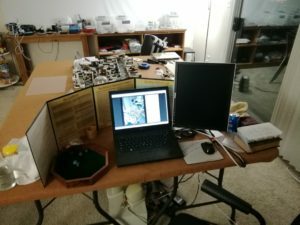 So, this is what is behind my DM screen, and a few details of how I play. And a picture from the front. I play with a notebook and a second screen in portrait mode so I can easily look things up, view handbooks or change music. I have an hourglass on the table that I flip when I want to get the players attention for something. I bought a magnetic Pathfinder Combat Pad to track initiative. I let the players manage it. The wooden dice tray I use I got on Amazon. It was relatively cheap but I like it quite a bit. I also have several wood and metal “chest shaped” boxes with misc things in them like rocks, keys, scrolls, letters, real animal teeth, etc. This adds to the immersive feel and allows the players to have a real feeling of “items” in the game. On the far side of the room is a set of glass beer mugs. They make for decent game-appropriate drink containers, and they are VERY bottom heavy so the players (hopefully) won’t tip them over. A few things I still want to add are some magic wand props and a more sorted musical playlist.